Baby Saves Stories | Problem Pregnancy of Worcester, Inc. These are real stories about abortion-intent mothers and their change-over to life for their babies. In July (2004) Kon, a Korean immigrant client came to our office with a 4 month old, beautiful baby boy and an amazing story of how that baby was saved by Problem Pregnancy and how perilous is the life of an unborn baby today. It began the previous November when Kon came to us, unmarried and pregnant by another Asian immigrant. Both demanded an abortion. Even after counseling, the couple were still adamant for the abortion. Kon told us that she was concerned for her own health because of debilitating Lupus. They did agree to an ultrasound and thereby discovered a baby boy. Immediately the father wanted the baby boy. If the scan had shown a girl, that baby would have been aborted immediately across the street. Kon, outwardly acquiescent to her man. agreed to life for the little boy. As we usually do, Kon received a set of scan photos in a little colorful baby album. Kon’s due date was March 2004. But now “the rest of the story”. This now proud Momma confessed that at 25 weeks pregnant, she had again changed her mind and decided to have an abortion after all. She then checked all abortionists in Mass. and none would do such a late term abortion. So Kon and her sister drove 1,600 miles from Worcester, Mass. to Wichita, Kansas to the notorious Dr. George Tiller’s late term abortuary. Incredibly, he killed babies right up to the delivery date. His name among pro-lifers was “Tiller the Killer”. She was still carrying her PPW ultrasound photos when she arrived in Wichita. Kon, then had another change of heart in her Kansas hotel room after looking again at the ultrasound photo album and so they drove back another 1,600 miles to Worcester. In March she delivered a healthy baby. So our ultrasound actually saved that little boy twice, once because the scan showed he had the father-required male plumbing and the second time when the mother looked again at the ultrasound photos in Kansas. By the grace of God the baby is very much loved by both parents and the mother came to thank us. By the way, a possible second miracle? – Kon is now completely Lupus free. Carol is a heroic sidewalk counselor saving babies by speaking to the abortion-bound mothers going into Planned Parenthood. As she does regularly, she spoke to Natasha (pseudonym) and handed her a brochure, as she was on her way in to kill her baby. Natasha did not seem receptive to Carol but once she was in the abortion facility, she began thinking about the words that Carol had said about her baby. When she was all prepared and on the abortionist’s stirrupped table, Natasha was still ambivalent and claimed that she need to use the bathroom. In Planned Parenthood’s toilet stall, she read Carol’s brochure and then cell phoned our office. With great emotion she asked Michelle, our counselor for help because she didn’t want to kill her baby. She was comforted, affirmed and counseled on the phone and then she fled the abortionist’s office and came across the street to Problem Pregnancy. Although, like most clients, Natasha has many ancillary problems. We were able to help her and she decided for life for her baby. Merella has been pregnant 10 times. This time she had taken the Plan B (morning after) pill however she got pregnant anyway. She came to Problem Pregnancy thinking we were abortionists. Luanne was her counselor and one of our best. Although Merella is 32 years old with 6 children and has had 4 abortions, when she saw her baby on the ultrasound screen for the first time, she was amazed. She said she never knew. Her reaction was immediate and dramatic. She began to sputter and loudly proclaim to everyone nearby how “sinful” it is to abort such beautiful babies. She also reacted by vowing to call Planned Parenthood to express her new pro-life opinion. She said she was going out to join the prayers on the sidewalk right then. And she will now deliver her seventh baby. The following are three recent client cases involving our ultrasound scanner. Anya (pseudonym) was in the abortion facility next door being prepared for an abortion when a Planned Parenthood staffer mistakenly allowed a corner of the ultrasound screen to be seen by Anya. (Abortionists but not clients are allowed to see the babies on ultrasound at Planned Parenthood. Some choice, huh?) When she saw her baby moving on the screen, she panicked, jumped off the table and ran out of the building where our outside counselor steered her to our office. We counseled her and showed her a full screen of her baby and she wept with relief. Anya kept saying, “I almost killed my baby. I almost killed my baby”. One saved baby! Marilee (pseudonym) called recently on our hotline and spoke to Sheila, one of our great hotline counselors and told her a long but happy-ending story, which I have shortened. Marilee was one of our first ultrasound clients last winter. She called to tell us how grateful she is that we were there to show her what she carried in her womb. She said that she was determined to have an abortion but once she saw her baby on the screen, she couldn’t do it. Her new baby was born this spring and she is bubbling over with joy and gratitude. Another saved baby! Lena (pseudonym) was sitting in Planned Parenthood’s waiting room with an abortion appointment. She was still not 100% sure about her “choice”. She told us later that she was depressed by the desperate atmosphere in the abortion facility’s waiting room; the other waiting clients seemed so very sad and many were crying. She had previously seen our sign and then like Anya, she “escaped” and came over to Problem Pregnancy “to talk about it”. Kathy (our great nurse/sonographer) counseled her and showed her baby on the ultrasound screen. Lena told us, as many others do every week, “I couldn’t kill my baby after seeing her on the screen”. Results of 3 cases = 3 Saved Babies and 3 Happy Mothers! 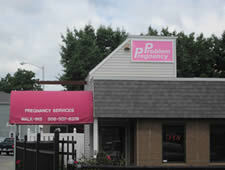 In June 2003 Problem Pregnancy was able to buy the building we had been renting (625 Lincoln St.) next door to Planned Parenthood’s abortion facility. It took every dollar that we had plus a big bank mortgage. Many very generous supporters helped us with the down payment and we thank them again. Our mortgage payment was now a little less than our rent payment was. In the past our abortionist neighbor, because of our aggressive baby-saving efforts, was able to get us evicted. Now no one will ever be able to evict PPW from our baby-saving location. But that was a precious year’s miracle. During the very rainy spring we discovered the joys of building ownership – our roof had developed very bad leaks and was ruining ceilings, etc. 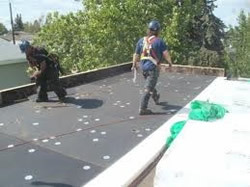 After much prayer and research, we decided not to just repair the roof but to tear it off and replace it with a long-lasting, slanted rubber membrane roof. The shocking prices ranged from $33,000 up. Finally we were able to find a family of roofers, two of whom were PPW supporters, who would do the job for $10,000 in labor costs. Under this plan we would save by buying the materials wholesale ($10,000) bringing the total to $20,000 that we didn’t have. I prayed and began to “put the arm” on some of our supporters. Relatively quickly we raised $10,000 and bought the materials. This capital expense could not be stalled. Good weather was necessary for the roof installation and “manana was not good enough” anymore.. This roofing family was available weekends and nights only. We arranged for them to begin on Memorial Day weekend. We prayed they would have four days of good weather. I still didn’t know where the remaining $10,000 would come from. The materials were delivered. A huge dumpster was dropped off for the debris from the old roof. They began and the weather was excellent throughout the four days – no rain. These men worked from 6 a.m. to 11 p.m. noisily tearing up the roof, pounding, sawing, nailing, etc. The neighbors even called the police one late night about the din. On the fourth day most of the work was done but I was told that another weekend was needed to finish it up. Thankfully, that gave me another week to come up with the dough! On Saturday morning of the following weekend, the job was almost finished and the money was to be paid within hours. There was a Mass in our chapel, celebrated by Fr. Michael Roy, while the pounding went on above. I prayed again as I had been praying, asking God to help us pay for the work. As I do on Saturdays, after Mass. I went to check our post office box. There were the usual bills, some address change returns, a few small donations, and mixed with some junk mail was a big gray, mysterious envelope. I opened it and was shocked. There was a $10,000 anonymous donation to Problem Pregnancy in the form of a bank check with no evidence of who was the donor – the exact amount needed for the laborers! When I went back to PPW, I was cheering and praising God and Fr. Roy was cheering with me. He and I agreed that God provides if something is needed for the right cause. This time He provided the very roof over our mothers’ and babies’ heads.